Crowded into the beautiful, narrow strip at the edge of the ocean, the large number of people who live near California's dynamic coastline often have little awareness of the hazards—waves, tides, wind, storms, rain, and runoff—that erode and impact the coast and claim property on a regular basis. This up-to-date, authoritative, and easy-to-use book, a geological profile of the California coast from Mexico to the Oregon border, describes the landforms and processes that shape the coastline and beaches, documents how erosion has affected development, and discusses the options that are available for dealing with coastal hazards and geologic instability. A completely revised and updated edition of Living with the California Coast (1985), this book features hundreds of new photographs and the latest data on human activity on the coast, on climate change, on rising seas levels, and on coastal erosion and protection. 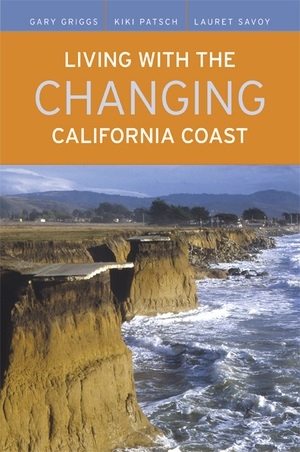 With its dramatic photographs and mile-by-mile maps, Living with the Changing California Coast will be an essential resource for those intending to buy or build along the coast, those who need specific information about various coastal regions, and those who are seeking information about how this remarkable coastline has evolved. Gary Griggs is Professor of Earth Sciences and Director of the Institute of Marine Sciences at the University of California, Santa Cruz. He is coauthor, with John A. Gilchrist, of Geologic Hazards: Resources and Land Use Planning (1983) and The Earth and Land Use Planning (1977). Kiki Patsch is Post-Graduate Researcher in the Department of Earth Sciences at the University of California at Santa Cruz. Lauret Savoy is Professor of Geology and Environmental Studies at Mount Holyoke College. 20. DANA POINT TO THE INTERNATIONAL BORDER.